The Aircast AirSelect Elite is the most-advanced walking boot, engineered to provide the ultimate in protection, comfort, and edema control. Duplex technology. Promotes faster edema reduction, thus promoting pain relief, patient compliance and faster healing. Low profile optimized rocker sole. The lab-designed rocker sole, enables a normal walking gait with less forefoot angulations' and reduces hyperextension of the knee. Trimmable and heat moldable semi-rigid shell. 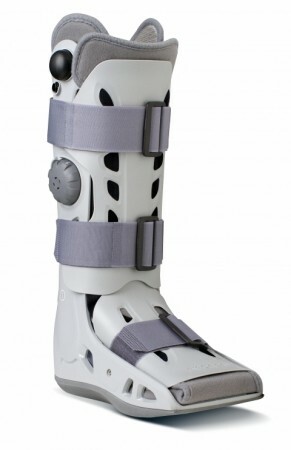 Makes it easy to custom-fit the brace to the patient for a more comfortable fit. Sleek, open-frame design provides ventilation and maximum patient protection and compliance. Shell contours around the malleoli, eliminating pressure for sustained comfort. AirSelect boots have improved width around the ankle area as well as uniformed sizing throughout the various sizes of the boot (XS-XL).